Accidents happen. For 55 years Kansas Jack has been helping shops repair even the most damaged vehicles. As one of the most trusted names in the collision repair industry, we understand the importance of fast and accurate repairs. 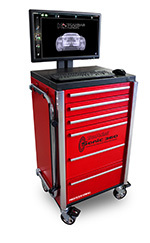 The Tru-Point Sonic 360 is a computerized electronic measuring system that relies on ultrasound technology for dramatic productivity improvements and the industry’s best speed and accuracy. Learn more about the Tru-Point Sonic 360. 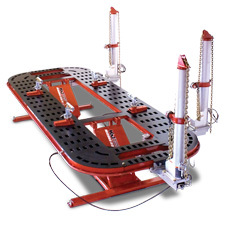 The Magna Rack SL & SL HD Series of frame-straightening racks have a faster pinch-weld anchoring system with fewer bolts to secure it to the rack platform. Learn more about the Magna Rack SL & SL HD Series. Snap-on is a trademark, registered in the United States and other countries, of Snap-on Incorporated. Other marks are marks of their respective holders. ©2019 Snap-on Incorporated. All rights reserved. By accessing and using this website, you agree that you have read and are bound by the terms and conditions set forth in the Terms & Conditions of Use, including the arbitration provisions. This web site is best viewed in the most recent version of Internet Explorer, Firefox, or other compatible browsers.